ROME — Italy's anti-establishment Five Star Movement, the political party vying for top spot in polls ahead of elections due by next year, has committed to scrapping the F-35 program if it takes office. "There will be no ifs or buts about leaving the F-35 program," said Tatiana Basilio, a Five Star member of the Italian parliament during a presentation of the party's defense manifesto on Thursday. Italy is currently due to purchase 90 F-35s and has already taken delivery of seven F-35As from its own final assembly line at Cameri in northern Italy. Three are now flying from the Italian Air Force's Amendola Air Base and four are involved in in pilot training at Luke Air Force Base, Arizona. Earlier this month the first F-35B rolled off the Cameri line, the first F-35B to be assembled outside the US. The aircraft, and its price tag, has long been a target for the Five Star Movement, which was founded by comic Beppe Grillo in 2009 and has since campaigned to cut down on corruption and waste in public spending. The party has risen in the polls in tandem with populist movements in other countries, and its leader Grillo has praised U.S. President Donald Trump and Russia President Vladimir Putin while criticizing the policies of the European Union. In recent months it has led opinion polls in Italy, just beating the ruling, center-left Democratic Party, ahead of general elections expected by next Spring. Preparing for government, the party has drawn up policies and ratified them through online voting by supporters, including a raft of defense policies which were outlined on Thursday. Five members of the lower house and senate stressed that Italy should be investing in cyber warfare before footing the bill for traditional offensive weapons like missiles and strike aircraft. "The central idea is the possibility to shift most of the public investment today used for traditional armament programs into development and research into more modern programs like cyber defense and intelligence," the party’s new defense manifesto stated. "€14 billion for 90 F-35s is too costly and we are putting ourselves in the hands of the U.S.," said Basilio. "All the software belongs to Lockheed Martin and we will never have a say, while all our pilots and maintenance staff must be trained in the US. If we were in government we would have already closed the program." Basilio said Italy should have opted instead to upgrade its Eurofighter aircraft to take on the strike role destined for the F-35. Senator Vincenzo Santangelo said the Five Star Movement was also pushing for better cost analysis of defense programs. "If we had that, we would never have entered the F-35 program," he said. "Cameri is not being used to its potential," he added. "We were told Cameri would be an international maintenance center but Italy appears to be at the end of the line for work." The Five Star politicians called for an overall lowering of Italian defense expenditure. "€5 billion a year on armaments is exhorbitant," said Basilio. NATO’s requirement that members spend 2 percent of GDP on defense was "not sustainable," added Santangelo. Five Star senator Bruno Marton said Italy’s recently approved €5.4 billion (U.S. $5.9 billion) Navy shipbuilding program was exaggerated. "The chance we will be invaded from the sea is remote," he said. The party also called for greater transparency in budgeting, describing Italy’s defense funding as "one of the least transparent programs of state spending." "Of all the funds provided for industry by the ministry of industry, 85 percent go on defense programs and we want to change that," Marton said. Calls for cutting defense spending are resonating among Italian voters caught up in a grueling economic down turn which has not let up since the financial crisis of 2008. The ruling Democratic Party has long seen the F-35 program as an electoral liability, and has promised to reduce spending on the program. 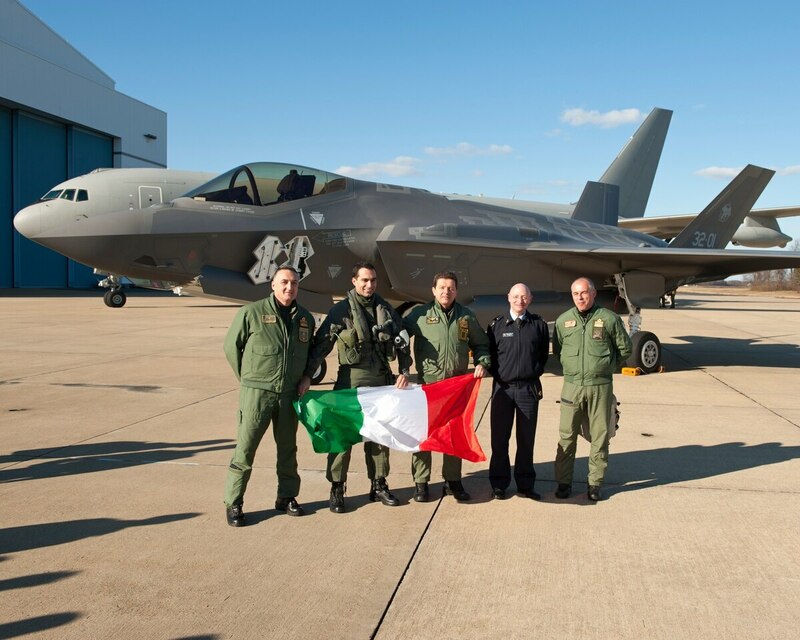 Little publicity has been given to the arrival of the first jets in Italy and the roll-out of the F-35B this month was barely reported. At the same time, Italian prime minister Paolo Gentiloni was very publicly urged by Trump last month to meet NATO’s 2 percent of GDP spending target. Italy currently spends 1.1 percent of GDP on defense. Speaking in Rome on May 11, defense minister Roberta Pinotti said Italy would be increasing its defense spending "in a reasonable way."